Compilation pubblicata nel maggio 1993, contiene brani tratti da due concerti: allo Zenith di Parigi (22 dicembre 1992) e a Londra (20 dicembre 1992). Le note di copertina erroneamente riportano che tutte le tracce sono state registrate a Parigi. Sul palco del tour per "Your Arsenal" salivano Alain Whyte e Martin Boz Boorer, il bassista Gary Day e il batterista Spencer Cobrin. Probabilmente l'album ha questo titolo "Beethoven era sordo" per un riferimento obliquo e auto-ironico alla mancanza di abilit� musicali convenzionali di Morrissey. This is a compilation, released in May 1993, of two live Morrissey concerts: at the Paris Zenith on the 22nd December 1992 and in London on the 20th December 1992. The sleeve notes incorrectly state that all tracks were recorded in Paris. Featuring the touring band of co-writers Alain Whyte and Boz Boorer, bassist Gary Day, and drummer Spencer Cobrin, this CD captures the excitement of Morrissey live during "Your Arsenal" tour. 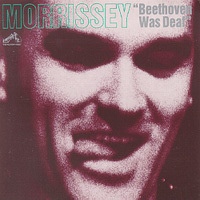 Probably the album is called "Beethoven Was Deaf" in an oblique reference to Morrissey's lack of conventional musical ability.